We start as usual with the mise en place. The pie plate at right contains the mashed remains of five bananas; the other three fruit would be sliced up to go on top of cake right before baking, so I haven’t even peeled them yet. The other wet ingredients are 100 g of sugar, two large eggs, a stick (112 g) of unsalted butter, one cup (240 ml, or about 1½ standard 170 g containers) of plain whole-milk yogurt, and two teaspoons of vanilla. On the dry team, we have 130 g of all-purpose flour, 90 g of traditional (red) whole-wheat flour, 30 g of almond meal, half a tablespoon each of baking powder and soda, a teaspoon of kosher salt, 130 g of chopped dark chocolate (I used Valrhona Manjari), and 60 g of toasted, chopped walnuts (I used black walnuts). 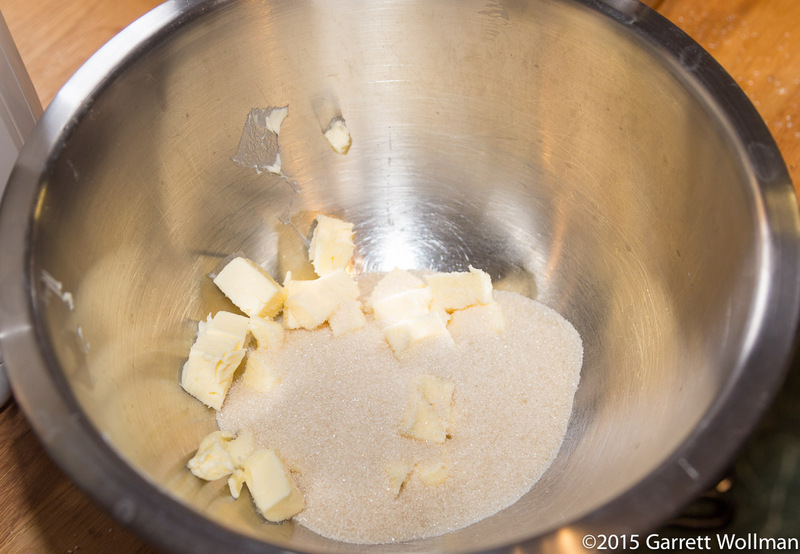 The recipe calls for creaming the butter and sugar together in a stand mixer, but the amount of both is so small that my stand mixer’s paddle would barely make contact, so I used a hand mixer instead. This cake certainly doesn’t need to be mixed in a six-quart bowl. After creaming, the recipe would have you dump all the rest of the ingredients in at once, or so it reads to me at least. I took a more judicious approach, adding all of the remaining wet ingredients, so I could still use the electric mixer, before folding in the dry ingredients (salt and leavening having been previously mixed with the flours). 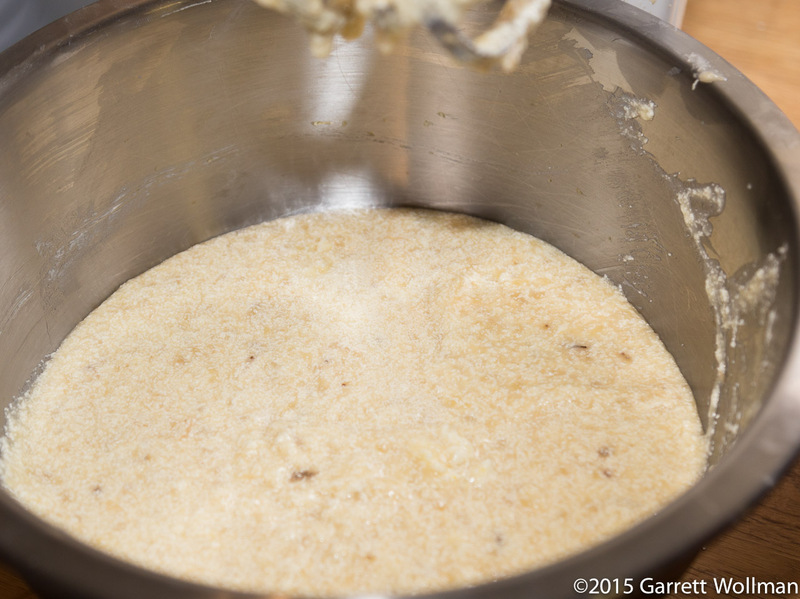 After folding the dry team into the wet, the cake batter is ready to pan up. Nathan suggests a variety of different pan formats in the recipe headnote, but the instructions are written for a ten-inch (25 cm) round cake pan, so that’s what I used. I used baking spray to adhere a parchment round to the bottom of the pan, then coated the entire pan with more baking spray for a clean release. Before baking, the remaining three bananas are sliced crosswise and arranged atop the batter, then sprinkled with an additional two tablespoons of sugar. The cake was baked in a 350°F (160°C) oven for just over an hour — the recipe gives an overprecise figure of 65 minutes — until a tester came out clean. 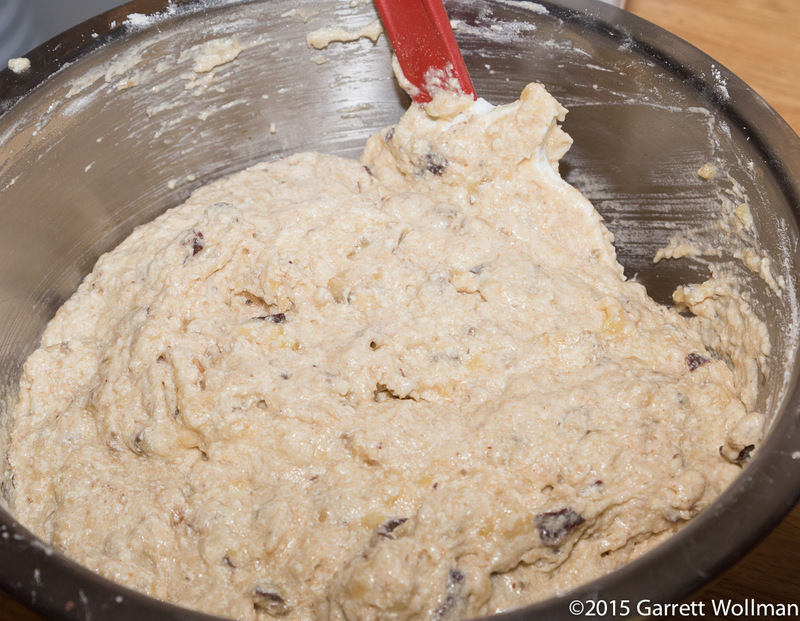 The cake cools for about 15 minutes in the pan, so that the starches have time to set up. You can see that the cake batter overflowed slightly (I wish I had remembered to take a picture of the unbaked batter so you could compare), but it didn’t make too much of a mess. As the cake cooled it pulled away from the side, but I gave it a bit of help with a paring knife to ensure that it wouldn’t stick anywhere and crack. 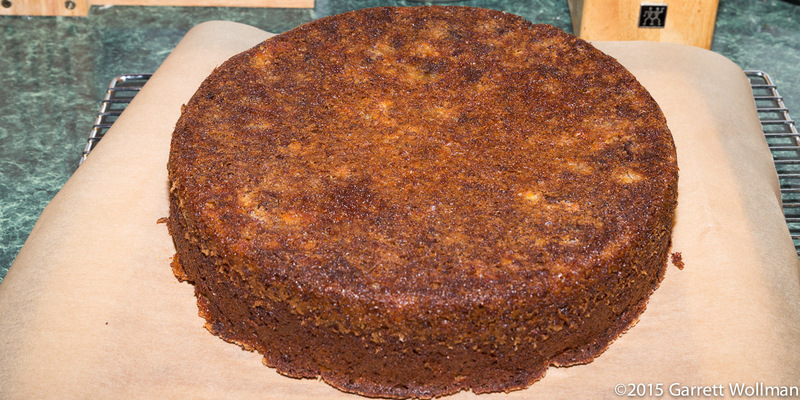 After 15 minutes of cooling, I inverted the cake onto a parchment-wrapped cutting board. Nathan says to carefully remove the parchment from the bottom, but I found that the parchment stuck to the pan when I pulled it off, saving me the effort. (The baking spray probably helped.) Some of the tasters would have preferred a bit less browning on the edges and bottom; these lightweight anodized-aluminum cake pans transmit heat rather too well. After removing the pan, one more flip was required to put the cake right-side-up on my cake stand. Unfortunately, I don’t have a photo of an individual slice to show you, as I was in a hurry to get to work Monday morning and didn’t pre-slice the cake like I usually do. I can tell you that the crumb was coarse, reminiscent of a quickbread, but very tasty. The chocolate chunks settled, for the most part, around the bottom and edges of the cake, which turned some tasters off; one taster complained about the banana slices on top. I felt the walnuts were probably wasted here: I certainly didn’t notice them, despite the fact that I had used black walnuts, which normally have a very distinctive flavor. 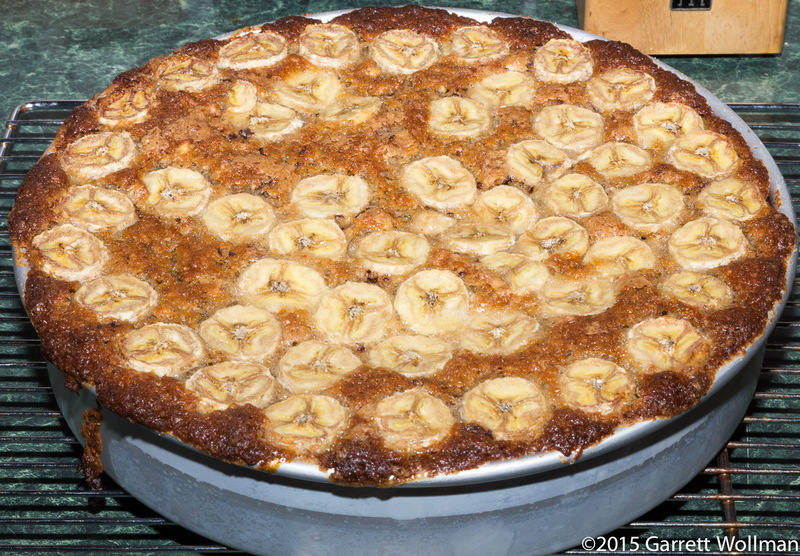 Sue Felshin commented that she would have preferred banana-walnut cake, or chocolate-banana cake, but didn’t think the combination of all three was very successful. Based on using Valrhona Manjari 64% for the chocolate chunks. 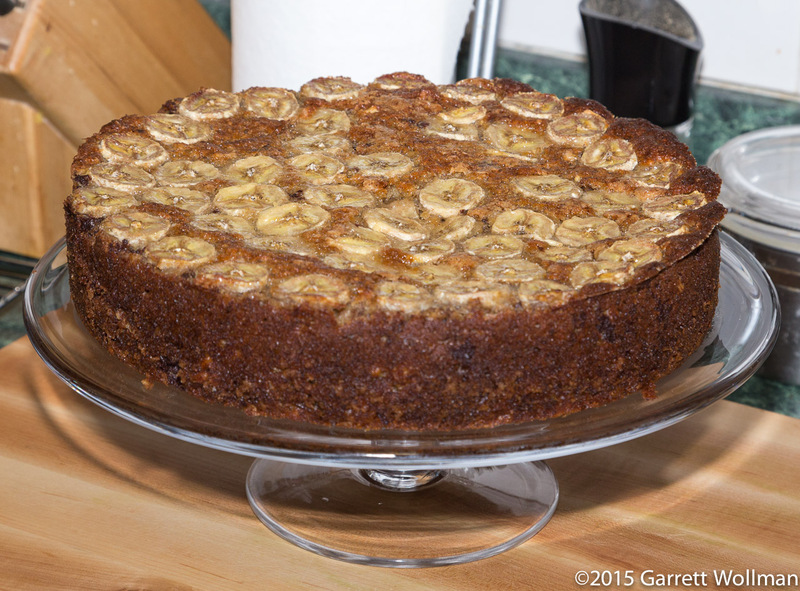 This entry was posted in Food and tagged bananas, cake, chocolate, recipe, walnuts. Bookmark the permalink. Perhaps next time, do it as an upside-down cake? You could put the banana slices on the bottom, preventing them from drying out while baking, and keeping them prettily arranged rather than at the mercy of the rising batter. I could, but it will undoubtedly be a long time before I get back to this cake. So many recipes, so little time….